As scientists scramble to understand this phenomenon, others view the giant waves as the ultimate challenge. These are extreme surfers who fly around the world trying to ride the ocean’s most destructive monsters. The pioneer of extreme surfing is the legendary Laird Hamilton, who, with a group of friends in Hawaii, figured out how to board suicidally large waves of 70 and 80 feet. Casey follows this unique tribe of peo­ple as they seek to conquer the holy grail of their sport, a 100­foot wave. 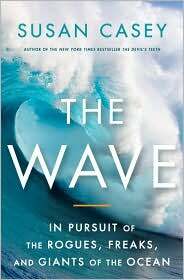 Like Jon Krakauer’s Into Thin Air, The Wave brilliantly portrays human beings confronting nature at its most ferocious. Susan Casey is the author of the New York Times bestseller The Devil’s Teeth: A True Story of Obsession and Survival Among America’s Great White Sharks. She served as creative director of Outside Magazine, where she was part of the editorial team that developed the stories behind the bestselling books Into Thin Air and The Perfect Storm, as well as the 2002 movie Blue Crush. The Toronto-born Casey was also recently named Editor-in-Chief of O, the Oprah Magazine. Why do you think there isn’t more news coverage on sunken freighters, tankers, and bulk carriers? Do tragedies at sea strike a different chord in the popular imagination than say, a plane crash? What’s the difference between surfing a wave and surviving it? What drives people to extreme situations and how does one draw the line between determination and courting disaster? Why do you think the psychological beating is often worse than the physical for surfers? Do you think Brett Lickle’s mishap towards the end of the book helped him see what was really important in life or psychologically cripple him? Surfers and scientists have different methods of judging a wave’s intensity. Is one rubric more accurate than the other? Susan Casey detected a strong female presence in the scientific community that seems to be lacking in the surfing world. Why do you think surfing—and tow surfing in particular—seems to be so male-dominated? How much of it is physical and how much is psychological? Many surfers in the book refer to themselves as “watermen.” They’re not simply athletes, or thrill seekers—they almost have a sixth sense when it comes to the water. What can we learn from these watermen in regards to how they regard and harmonize with the ocean? What responsibility, if any, do you think these adventurers have to the ocean and to each other? After Susan Casey witnesses a sixty-eight foot wave at Killers, she remembers Laird Hamilton’s assertion—“If you can look at one of these waves and you don’t believe that there’s something greater than we are, then you’ve got some serious analyzing to do…” How has your perception of the ocean—and those who study it and ride its waves—changed after reading The Wave?